exophthalmos in children. It may be difficult to differentiate a periorbital or anterior lid cellulitis from a true posterior orbital cellulitis. 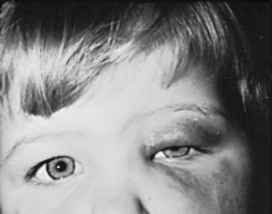 With a true orbital cellulitis, the child or adult has pain on movement of the eye, conjunctival edema, and limited extraocular movements. The most common causative organisms are S. aureus, Streptococcus, and H. influenzae. Cultures should be obtained from the nasopharynx, conjunctiva, and blood. Immediate hospitalization and ophthalmic consultation are necessary. Emergent computed tomography (CT) should be performed to rule out orbital cellulitis. If orbital cellulitis is diagnosed, immediate hospitalization with intravenous (IV) antibiotics and ophthalmologic consultation should be undertaken. Appropriate systemic antibiotic treatment depends on the causative organism. Cavernous sinus thrombosis, meningitis, and blindness are serious complications of orbital cellulitis.